You can also buy duty-free goods at the new harbour where boats from Turkey arrive and depart, and also from the main shipping port in Famagusta. Since 2006 holidaymakers have been allowed to obtain a refund on tax for their goods when leaving North Cyprus, a decision which was made to boost the tourism trade. Sadly for those of us living here it doesn’t count! Many types of goods including luxury items such as gold and jewellery, designer clothing, textiles and electrical goods will all fall within the sphere of the scheme, meaning that North Cyprus is a great value destination For travellers, particularly as many of these items are already cheaper in the North of the island anyway – even before the return of duty paid. 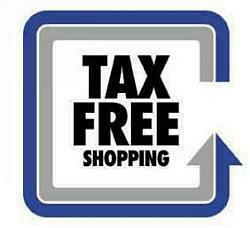 Shops which have applied to join the scheme will display the ‘Tax Free’ sign on their premises so that you know they are a good bet for some bargains, and all you have to do is keep hold of your receipts and produce them on your departure. There is a minimum amount on which tax can be refunded and this is based upon half the current working minimum wage, which does change every few months to keep in line with inflation, so it may be worth asking the shopkeeper for their advice. However, it should be roughly about GBP 300 or thereabouts. Given the amount of goods available under the scheme you may find it actually quite easy to accrue the necessary amount, as there is so much to choose from. Tax can be refunded on anything from clothes, computers, shoes, jewellery, cosmetics, mobile phones and much more, so it shouldn’t be hard to pack your suitcase full of tax free shopping to return home with! It’s a very easy process and is made easier by the fact that travellers only have to produce their receipts when they leave North Cyprus at the offices set up at each departure point.